I had the chance to see The Dark Knight last night with a friend, and I think I can sum up the movie in two words: Mind Blowing. I loved Batman Begins when I first saw it nearly three years ago, and I the sequel is even better. Director Christopher Nolan has created a masterpiece here – a movie as good as most crime thrillers and better than any comic book movie I’ve seen (note: I haven’t seen Iron Man yet). It’s dark, real, and intense, and makes the 90’s Batman movies seem as campy as the 1960’s TV series. I wish I could forget I ever saw them (George Clooney as Bruce Wayne? Are you kidding me?). 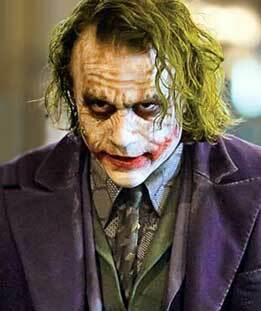 While countless others have said it before me, I’ll say it anyway – Heath Ledger is brilliant as the Joker. He disappears in the role, and you simply forget who’s playing this evil, insane genius. A self described anarchist, the Joker appears to have no agenda other than to create chaos. He seems to thrive on putting people into situations that force others to make extremely difficult ethical choices, including a version of the prisoner’s dilemma like you’ve never seen before. It’s sad knowing that we’ll never get to see Ledger put on the Joker makeup again, but I can’t wait to see what Nolan has in store for the next chapter of Batman.